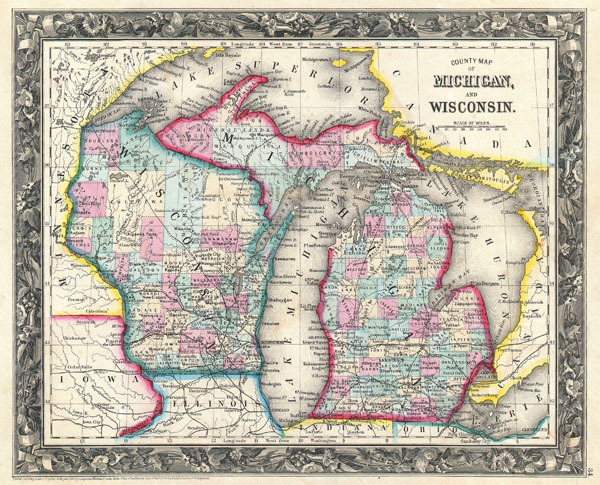 County Map of Michigan and Wisconsin. Mitchell Jr., S. A., Mitchell's New General Atlas, Containing Maps Of The Various Countries Of The World, Plans Of Cities, Etc. Embraced In Forty-Seven Quarto Maps, Forming A Series Of Seventy-Six Maps And Plans, Together With Valuable Statistical Tables, (1860 first edition). Rumsey 0565.024. Phillips (Atlases) 831-34.